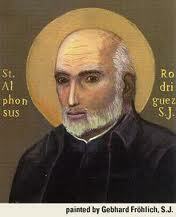 Alphonsus Rodriguez was born in Segovia, Spain, on July 25, 1533. He was the second son of eleven children of a successful wool and cloth merchant and the family was financially comfortable. Alphonsus had contact with the first Jesuits at a young age. When Blessed Peter Faber (one of Pope Francis’ models) came to Segovia to preach, Alphonsus’ family offered him the hospitality of their home and Faber prepared Alphonsus for his first communion. When Alphonsus was 11 years old, his father sent him to the Jesuit college at Alcala but he never completed his studies due to his father’s sudden death. He helped his mother run the family business and eventually took over the business. At the age of 26 Alphonsus married Maria Suarez. They had three children together but a series of tragedies hit Alphonsus. In a brief period of time, his three children and his wife died. Around the same time, he was forced out of the clothing business due to heavy export taxes on wool products. Viewing himself as a failure and filled with internal anxiety and distress, he sought spiritual direction from the Jesuits. He eventually developed a desire to enter religious life. He had met some of the first Jesuits to come to Spain, including but his age and lack of education was a major obstacle to his joining the Society. His extreme penitential practices had also undermined his health. Eventually, in January 1571, at the age of 37, he was accepted into the Jesuit novitiate as a brother. After just six months he was assigned to the College of Montesion in Palma de Mallorca where he served as porter or doorkeeper until the end of his life 46 years later. Over this long period he exerted an extraordinary spiritual influence not only on his community but on the students and all those who came to the porter’s lodge for advice and direction. He was already 72 when a young Jesuit, Peter Claver, came to the college, filled with a desire to do something for God but uncertain how to do so. The two became friends and often discussed prayer and the spiritual life. The elderly Brother mentor encouraged the student to go to the American missions. Peter would become famous as the apostle to the thousands of slaves brought over from Africa and who landed in Cartagena. Alphonsus practised very severe penances and suffered sometimes from scruples. His obedience was total and at all times he was steeped in prayer. He left behind quite an amount of writing, some of it simply notes from spiritual talks given to the community. He had no intention of making them public and some were written in obedience to superiors. He died on October 31, 1617 aged 84 at Palma, Mallorca and was declared Venerable in 1626. In 1633 he was chosen by the Council General of Majorca as one of the special patrons of the city and island. In 1760 Pope Clement XIII decreed that “the virtues of the Venerable Alonso were proved to be of a heroic degree” but the expulsion of the Jesuits from Spain in 1773 and their suppression, delayed his beatification until 1825. He was canonised by Pope Leo XIII on September 6, 1887. His remains are enshrined at Majorca. This entry was posted in Uncategorized and tagged Alphonsus Rodriguez, Catholic Saints, Gerard Manley Hopkins, Ignatian, Jesuit, Peter Claver, Peter Faber, S.J., Saint, Spanish mystics, Spanish saints, St Alphonsus Rodriguez. Bookmark the permalink. Thank you. I am flattered! I hope you have a fantastic All Saints Day also!